Since the aftermath of Christmas I have been rather busy. These are all things that go with the game that LISA got for us for a family Christmas gift. I watched Abigail play it, and it seemed like a kiddie kinda thing. Hey, she seemed to like it, and it's nice to see her out recreationally fishing... even if it is with the Wii. Then I tried it. OH. MY. GOSH. First, it was just watching Abigail, and noticing what she was doing as she wandered about the town. "Abigail, you're supposed to pay off your mortgage! It's only 18,900 bells. I'd do that first. After you do that it says here in the book that you can buy a bigger house!" And then I got a little bit more involved: "You need to stop buying wallpaper, and pay that off first. 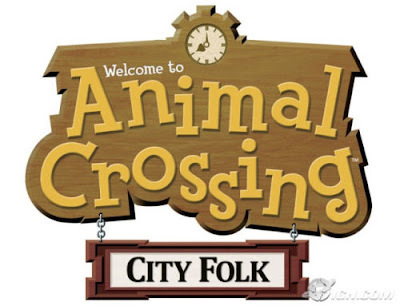 Look there's an animal that will trade turnips to you, and if you sell them to Tom Nook, he'll give you more money! 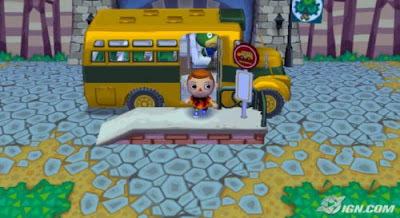 And if you put some in your savings account, you'll get more bells (the local currency) just for having left it there!" Then I thought, TO HECK WITH IT! And got my own character, and my own house! And then Matthew got his. And then Benjamin got his. We are now swapping items. I gave Abigail a set of stair drawers, and she's mailing me a violin as a gift. I know, I'm INSANE! I'm INSANE! Who DOES this?! Well, LISA does now! She got the game after asking how it was going, and we are feverishly trying to figure out how to get our two towns to connect so that I can go and swap some of my peaches for her pears. She called me all flustered: "We're all playing it now! It's like an obsession, it's like... HEROIN!" Ya gotta love it, they named their town "Squallor". Its so funny to see the comments throughout your visit there, "Welcome to the Squallor Museum!" I was about to be totally impressed (and I thought bells was the new slang for dead presidents) until I finished the post. Nonetheless, it must be an incredibly clever game if it has you all so involved. Let the good times roll! Yah, I suddenly wish I had a Wii so I wouldn't be the lone man in the Garden of Draper with not a frigging clue about what my sisters are talking about.